The potted plants were placed in a circle above a fountain. Which plant seems to be the most beautiful to you? The truth is, they are all very lovely. Each has its own characteristics that God has chosen for it. They are His creation, and it pleased Him to make them, just the way they are. It’s that way with people too, you know. Every person is important to God. We are all His creation, and it pleased Him to give us life. The truth is, we are all “lovely” or of great worth to God. Each of us has our own characteristics that God has chosen for us. I may be a “rose” while you are a “daisy,” but that doesn’t matter to God. We were all important enough to Him to send Jesus to die on the cross to pay the penalty for our sins. 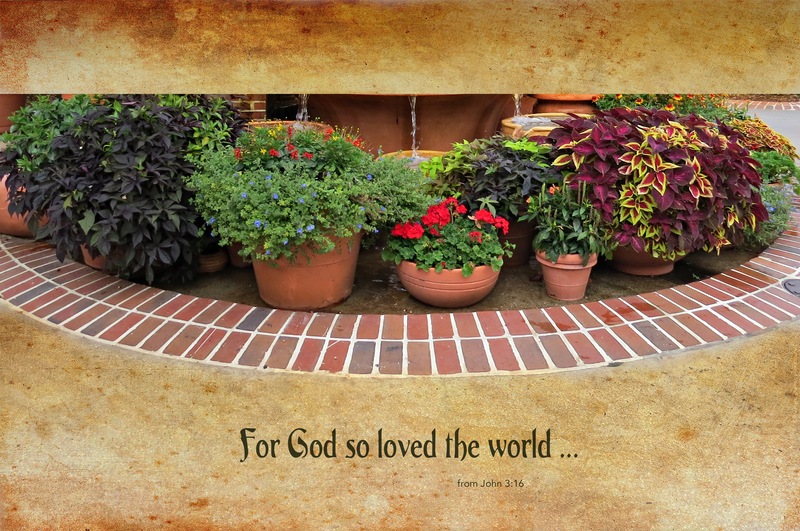 This entry was posted in Christian Devotions, Church, flowers, General, Inspirational photography, Main, nature, photography, Photos with Christian thoughts by Myra Johnson, Spirituality and tagged flower arranging, John 3:16, love, plants, potted plants, salvation.